HARMONiQ is a revolutionary sales, accounting, inventory and business management software – all in one. Is an ERP right for you? A completely integrated business solution. Software that will support your business, not disrupt it. 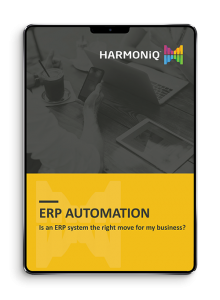 HARMONiQ is a customisable and scalable business management and ERP software solution that lets you optimise your processes to drive efficiency, while also providing the flexibility to support business growth. With the ability to integrate processes from CRM, to e-Marketing to inventory and stock control, HARMONiQ offers a complete integrated business solution – giving you the ability to streamline processes while maintaining full transparency across business operations. Within wholesale and distribution industries, inventory and warehouse management is a huge job – and one that is hard to do effectively. It greatly affects a business’s ability to manage cost and can negatively impact both profitability and customer experience. Process automation works with your existing systems to automate workflow, increase productivity and decrease costs caused by inefficient manual practices. With HARMONiQ, inventory and sales management are combined with business reporting software, producing transparency across the entire business so you always know the where, when and why of your products, sales and performance. HARMONiQ’s general ledger provides powerful financials for your business – supporting multi-currency trade if required. The advanced inventory system saves you time by being able to stock and track inventory by piece, box, pallet, shades and size, with product images on-screen for sales staff. Generate insightful reports on all aspects of your business, forecast revenue and track your pipeline with advanced reporting functions. Get automated and accurate insights in your stock. Easily manage stock levels according to orders and sales. Get full visibility of your entire inventory in every warehouse. See what’s available and what’s committed (e.g sales, quotes, held/picking, transfer, allocation, backorders). Produce accurate quotes with powerful job costing capabilities. Automate and track sales orders and quotes to improve your staff and customers’ experience. Provide your staff with one platform for tracking and collaborating on sales, inventory and performance. Produce beautifully designed emails with sophisticated segmenting to send and track targeted emails to your database. Collect and curate all customer data in one easy to access location to streamline how your team sells and markets. Integrate your financials, reporting, sales and CRM platforms to give you an accurate big-picture view of your business performance to plan effectively for the future. With Front-to-Back office and warehouse management, your sales staff will have full visibility of inventory for multiple warehouses, with on-screen images of each product. Automation is the way of the future. Transform your business efficiency with clever and customisable workflow automation.